Please stay off new sod until after the first mowing. Proper watering of sod is essential for root establishment. The day of installation, enough water should be applied to penetrate the sod and two inches of native soil. From day two on, keep your sod and soil moist throughout the day. The roots are short so the sod cannot withstand large amounts of water at a single time. Other than the first day, the ground under the sod should never be soggy. Usually watering four to six times during the day, for approximately five to six minutes each time, is required until the roots have been established. Root establishment will usually begin within seven to fourteen days depending on the time of year your sod is installed and your environment. Too much water will rob the roots of oxygen and in warmer weather that possibly can lead to disease. The length of each watering cycle will depend on your soil type and the output of your irrigation system. A clay type soil may need five minutes, four times a day compared to a sandy loam which may need seven minutes, five times a day. You have to judge the minutes given, but here is a tip: If the water is standing under the sod for more than just a few minutes after an irrigation set has finished or if the soil is soggy, you are probably giving the sod too much water at one time. Avoid, if at all possible, watering into the evening hours (after five-thirty or six pm); this is one of the fastest ways to create a fungus problem. Start reducing the frequency of watering cycles just before the first mowing. This will firm up the soil for a healthy mowing cycle. The first mowing should be approximately 14 days after the sod has been installed. In the winter you may need to wait longer for the roots to establish prior to mowing. Never mow off more than 1/3 of the blade during a mowing cycle. This results in less stress for the plant. Reduce the frequency of times you water at a gradual pace. You can validate the establishment of the roots by pulling up a corner of the sod, and if you feel some resistance, you can eliminate the last irrigation set of the day. However, you need to add a couple of minutes to the other irrigation sets. Now the roots should be deep and can tolerate a few more minutes of water per cycle. In another week or so you can repeat this process until you are only watering once a day. Deeper, less frequent watering will help roots stretch down deeper and establish quickly into the soil. 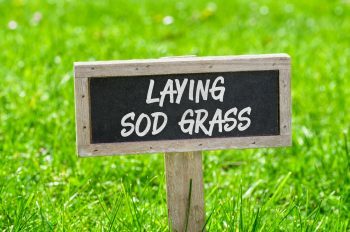 Fertilize your new sod approximately four to six weeks after installation to ensure continued establishment of the roots. 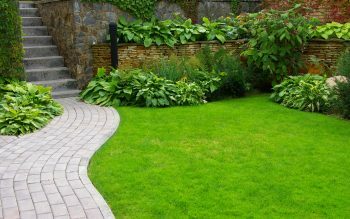 Our Bolero™ Lawn Food is an excellent choice for any blend or variety of sod. It can also be purchased through any of our distributors.